The mark of the best players and best teams in basketball is not always about their margin of victory but in how they bounce back from defeat and setback. Coming into the second game of the 2014 NBA Finals, the bookmakers were convinced that the Spurs were set to take a 2-0 lead and really crank up the heat on Miami. There was confidence that the Air Conditioning in San Antonio would be on its bets behaviour but it was still tipped to be too hot for the heat. This wasn’t the case though and the Spurs will be sitting down today wishing that LeBron James wilted during the second match of the series as well. He didn’t and he was instrumental in the thrilling 98-96 victory for the Heat which tied the series at 1-1 after just two games of the best-of-seven series. LeBron was the top scorer in the game with 35 points, which sat neatly alongside 10 rebounds and 3 assists over the course of the game. With 1 minute and 17 seconds left on the clock, James delivered an assist to Chris Bosh for a 3 pointer. This put the Heat into the lead and they held on to see out the victory. If you are looking for a team that knows how to bounce back after a defeat, this was the 13th time the Heat had won in the game after they had lost. At a point in the second half the Spurs held an 11 point lead and they must have felt they were good to make it 2-0 in the series. However, this was at the point when James started to turn up the heat in the game and by half-time, the scores had been levelled at 43-43. The Spurs opened up a 6 point lead in the third quarter but with LeBron going on a jump-shot spree, this was turned into a 64-62 lead for the Heat. With two 3 point shots coming either side of a jump-shot just inside the arc, James was on fire at this point but it was for the right reasons, not the reasons of the 1st game of the series. It was a game that was going from end to end and in the 4th quarter, Spurs must have felt they had the chance to see the game home. They had a two point lead at 87-85 and while Wade and Bosh of the heat were on the bench, San Antonio’s Tony Parker and Tim Duncan both managed to miss a pair of free throw shots. This gave LeBron another opportunity to make his mark on the game and it wasn’t something he was going to pass up. However, with James in blistering form, it wasn’t as though Spurs defensive players had a poor game. In the review, it is likely the Spurs will be looking at their offensive play and the opportunities they miss to put the game to bed and out of reach of the Heat. The 3rd game in the series takes place on Tuesday and the bookmakers are tipping the Heat to take a lead. At Bwin you’ll find the Heat priced at 1.50 while the Spurs are at 2.65. Over at Bet365, they haven’t priced the next game in the series up yet but they are now providing odds of 1.71 for the Heat to win the series, while Spurs are listed at 2.20. 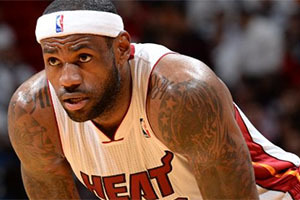 The bookmakers got it wrong for match 2, how will they fare in match 3 and the rest of the 2014 NBA Finals?